This work brings Niebuhr's Christian realism into dialogue with political issues and foreign policy issues in the modern world. It uses Niebuhr to address issues of terrorism and attacks pacifism as a legitimate ethical stance in the face of terrorism and contemporary wars against terror. Reinhold Niebuhr's "Christian realism" combined theological insights with moral and political reflection, helping to guide society through its struggles for peace and justice during the mid-twentieth century. Without illusion or despair, he illuminated the possibilities and the limits of human existence. His perspective remains relevant for the problems and issues of our own time. Stone's book applies Niebuhr's insights to contemporary international relations. He takes the social thrust of religion seriously as he argues that the study of international relations is a necessary part of the study and practice of religion and ethics. According to Stone, religion, ethics, and politics are inextricably bound. 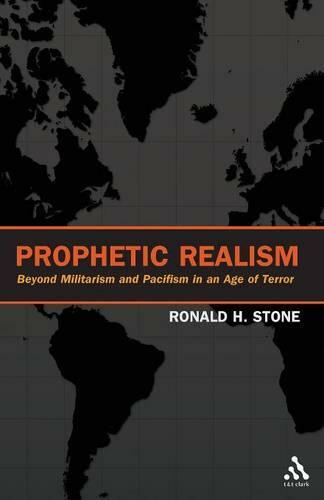 He argues that prophetic or moral realism is the way to approach foreign policy. The first three chapters of the book trace the development of prophetic realism from its Biblical sources through various historical stages, including both Western and non-Western sources. Chapters four and five define American prophetic realism and examine contemporary critiques of realism. Chapters five through seven revisit arguments over pacifism and prophetic realism. The final chapters discuss contemporary ethics in ethics and foreign policy: human rights, terrorism, and resistance to imperialism.